I worked on this fun project for HGTV.com, AphroChic, and photographer Leon Belt believe it or not earlier this year in the springtime. For this particular project, I collaborated with AphroChic on selecting the upcycled props for photo shoot. I was also responsible for scouting the location, and I was stylist for this shoot. In this photo Jeanine Hays and I used cut up pieces of tissue paper from the Christmas holiday to repurpose as New Year's Eve confetti. In the background we used old wrapping paper as wallpaper to set-up a DIY photo booth in your home for New Year's Eve. During this project there were a lot propping elements that had to be sourced for this shoot. We had flowers, vintage ornaments, desserts etc. staged that day for the photo shoot. We blew up over fifty white balloons to go above the dining table for this project. I don't know if I mentioned we also laughed a lot in the process. 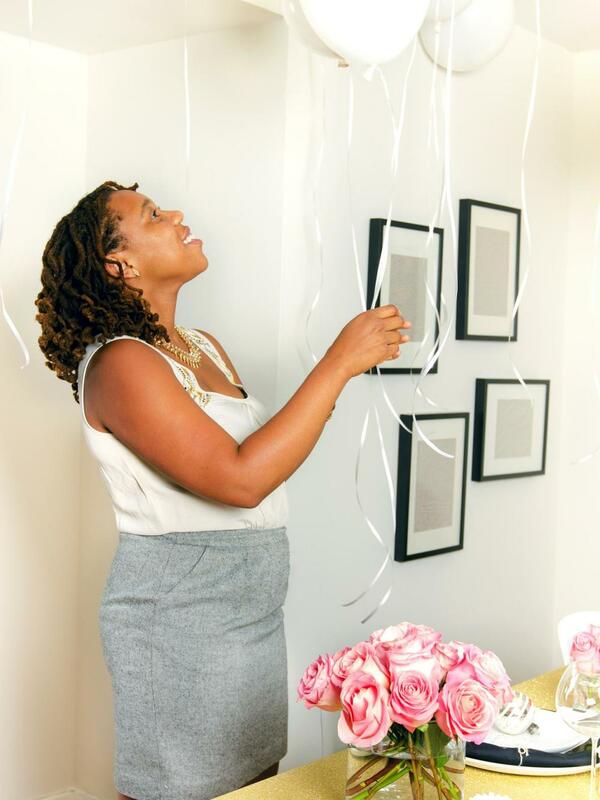 In this photo we wanted to make sure the photographs feel light and airy, which is why we selected white balloons and silver ribbon to play off of the white walls. In this shot I wanted to create a small vignette of all the items you could use from the Christmas holiday for your next New Year's Eve bash. In this shot we wanted to make sure the silhouettes and shapes of the plates popped so we chose a black, white, and pink/red color palette for this shot. To see more from this photo shoot click here. Happy Holidays!